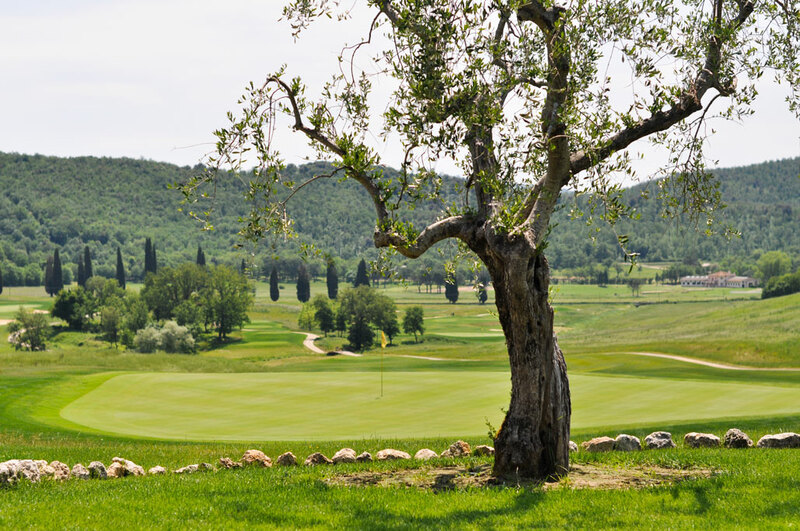 The Royal Golf La Bagnaia, Siena in Tuscany, offers fans of this sport an 18-hole course designed over 130 hectares of wooded hills and relaxing landscapes. The prestigious project was designed by renowned golf architect Robert Trent Jones Jr. and skilfully created to blend with the ancient melody of the surrounding area. 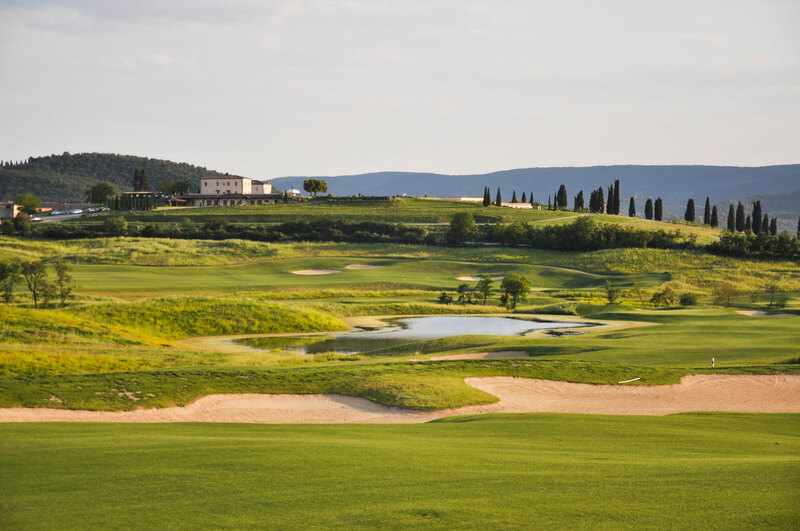 A choice that has promoted Bagnaia Resort to the top in Tuscany golfing circles and offers you one of the most interesting golf courses in Italy. Tuscany is located in central Italy and stretches from the Apennines to the Tyrrhenian Sea. Its landscape, artistic heritage and stand-out cities - first among them Florence - make Tuscany an unquestioned protagonist of international tourism. In this region, nature has many different facets, starting from the coast that alternates long and sandy beaches, like the Versilia beach, with rocky cliffs and steep headlands. The islands of the Tuscan Archipelago, surrounded by Mediterranean vegetation, a crystal-clear sea and rich seabeds, are peerless. You can admire sceneries of uncontaminated nature in the Apuan Alps and in several protected areas, such as the Orbetello Lagoon, home to many species of migrant birds, including pink egrets. However, the most typical sceneries of the region are those that merge the beauty of nature with the millenary work of man. The amazing Gulf of Baratti and the sites of Vetulonia, Vulci and Pitigliano guard necropoli and vestiges of the Etruscan civilization, while Roselle and Cosa evoke memories from the Roman Age. Situated in northeast Tuscany, the Province of Florence covers areas with different geographical and environmental characteristics, including Mugello, Montagna Fiorentina, Valdarno, part of Chianti and Empolese-Valdelsa. At the Province's center, in a basin crossed by the Arno River, stands the magnificent City of Florence, one of the most beautiful cities in Europe, filled with historical relics and artistic masterpieces by the greatest masters of Humanism and the Renaissance. These creative geniuses made an indelible mark on the world’s architecture and art: Giotto and Brunelleschi, Michelangelo and Vasari, Michelozzo and Leon Battista Alberti, just to mention a few. Every year, Florence, unanimously recognized as the cradle of the Renaissance, attracts crowds of Italian and foreign tourists to admire the marvelous churches, sumptuous buildings, and museums that make it so unique. The city’s charm also extends to its territories, beginning with the natural amphitheatre created by the hills surrounding Florence, where unique places such as the small towns of Fiesole and Certosa del Galluzzo stand. The whole area is made up of stunning landscapes such as the Chianti Valley, where visitors can follow numerous art or wine and food itineraries, and other areas, from Mugello to Valdarno, that hold a wide variety of surprises: ancient castles, Medieval rural churches, and villas. Wherever one turns, historical towns and art treasures make this province absolutely unique, a place where nature and culture intertwine as in a dream. Each and every town, with its own particular features, is a world to be discovered: Empoli with its rich cultural heritage contained within 15th-Century city walls; Sesto Fiorentino with the famous “La Montagnola” Etruscan tomb; Impruneta, with its terra-cotta production; or Borgo San Lorenzo, with the remains of its 14th-Century fortifications and a magnificent church; and Castelfiorentino and Barberino Val d’Elsa, among many others. The Florentine territory provides a surprising number of itineraries, making a vacation here an ideal occasion to explore this enchanting area. Situated in central-southern Tuscany, the Province of Siena extends over some of the most famous and fascinating Tuscan territories, e.g. the southern hills of Chianti, Val d’Elsa and Val di Merse, Val d'Arbia, Val di Chiana and Val d'Orcia, right up to the slopes of Mount Amiata. The Province’s Capital, Siena, is a magnificent city of art with characteristic alleys, wards (rioni) and towers, artisan shops and buildings that make it a not-to-be-missed touristic destination for Italians and foreigners. Moving through Siena’s lands and immersing yourself in this atmosphere is a magical adventure, a trip through many landscapes, from dense woodlands to old farms, from clay hills to stupendous paths. Furthermore, the territory preserves numerous remains from the Middle Ages, springing out along the Via Francigena, the great pilgrimage road to Rome that crossed Val d’Elsa, the city of Siena and Val d’Orcia. Walking through this countryside, you can admire impressive abbeys such as Sant’ Antimo, Romanesque parishes (pievi) and characteristic small towns (borghi) such as San Quirico d’Orcia or San Gimignano, which preserve their original appearance to this day. The Chianti area, home to the famous wine, is also an enchanting part of Tuscany that hosts tucked-away towns such as Castellina, and dense vineyards, such as those of Radda in Chianti, Gaiole in Chianti or Castelnuovo Berardegna, as well as delicious enogastronomic itineraries. The landscape south of Siena leading towards the Medieval center of Asciano is dominated by the typical Crete, clay lands where erosion has created crevices, openings and cracks. It is an impressive area where the imposing Abbey of Monte Oliveto Maggiore stands out. Val d’Elsa is also very impressive with its characteristic towns Colle di Val d’Elsa, Poggibonsi and San Gimignano, that boasts inestimable artistic heritage. Val di Merse is constituted of solitary but fascinating places, including the ruins of the San Galgano Abbey that date back to the 13th Century. Val di Chiana provokes emotion and offers its visitors elevated health and well-being, thanks to its thermal spa centers in Chianciano Terme, Montepulciano and San Casciano dei Bagni. Hills and gullies, Tuscan cypress trees, the river, olive groves and vineyards: this is the landscape animating Val d’Orcia, protected by UNESCO. Here magnificent towns abide, from Pienza and San Quirico to Montalcino and Castiglione; in the west lie Mount Amiata and the solitary Rocca di Radicofani.